Friends, today the design freebie relates to music! It is a set of dark UI elements in PSD format that can help you prototype some nice designs for your music related app / programs or websites. As always, the PSD file contains several different popular UI elements created using shape layers. Editable layers allow you to easily edit and make changes to fit your designs for iOS / android apps, web interfaces, etc. 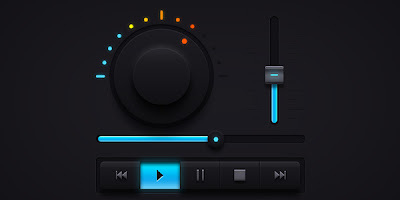 The freebie includes UI elements such as volume knob, equalizer, music controls, sliders, buttons, and more to name a few. Let me know what you think of this download.